Raised Supreme Nylon AirBed Air Mattress - The convenience of a portable airbed with the comfort of sleeping on a raised platform. Plush, waterproof nylon flocking covers the mattress top. An indentation on the side helps grip fitted sheets. Dual chamber construction. The lower chamber functions as the box spring platform on a traditional bed, providing extra firmness and support. The upper chamber functions as a mattress and can be adjusted for level of firmness. The Queen sized mattress (approximately 60x80") is raised approximately 22" from the floor for convenience. The Mid-Rise (Queen is approximately 64"x82", Twin is approximately 40x80") is raised approximately 19.5" from the floor. Cozy nylon flocked fabric mattress top. Deflates completely for travel and storage. Includes duffel bag with shoulder strap. Weight capacity is approximately 600 lbs for the Queen Size. New Wireless Remotes, Backrests and Memory Foam Padded Airbeds now available. Electric Air Pump included on select models below. 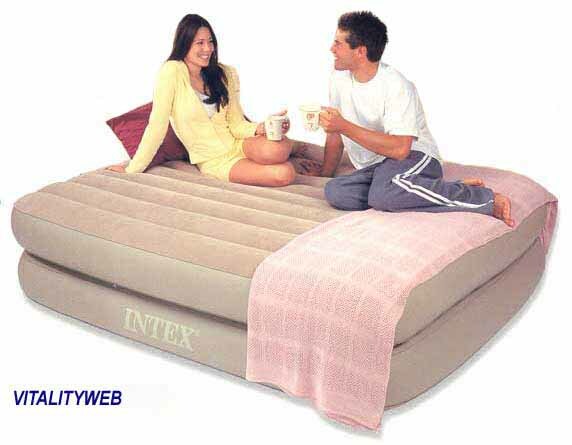 All sizes are approximate as inflation pressure and use will affect the overall size of these airbeds. 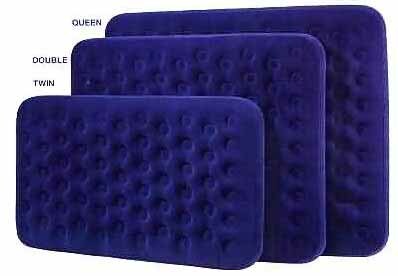 AIRBEDS are IN STOCK for fast shipping. 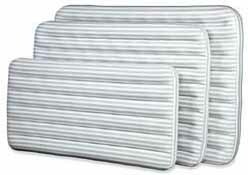 Airbeds do not have a warranty or guarantee for punctures/loss of air. 19.5" Mid-Rise Twin & Queen with or without 120V Wall AC pump. Raised 22" High AirBed is available in two versions - one with a separate rechargeable pump (66713) & one with a built-in 120V Wall AC pump (66717). 20" Raised Air Bed has a Wired Remote to easily control the 120V AC Air Pump! Includes a Memory Foam Topper Pad Layer!! Extra AIR PUMPS are also available. 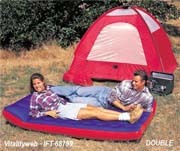 Fast-Fill Camping Airbed with DC Pump - Easy to inflate, deflate and store air bed. Approximately 9" high when fully inflated and includes a Built in 12 Volt DC pump that easily plugs into a vehicle cigarette lighter or accessory socket on boats and recreational vehicles. Available in Twin, Full and Queen size. Economy AirBed Air Mattress - Quality tested vinyl 15 gauge beams and 14 gauge top and bottom. Quick free flow deflation plug. Compact storage. Approximately 7.5" inflation height. Available in Twin (39x75"), Double(54x75") or Queen size(60x80"). Air Pump not included. Downy Rayon AirBed Air Mattress - Plush rayon flocking on the top of the mattress for a more luxurious sleep surface and helps keep bedding from slipping. Flocking cleans easily and is waterproofed for camping use. Wave beam construction eliminates uncomfortable surface bumps and provides a flat, uniform sleeping surface. Crafted for quality with cozy rayon flocked tops and heavy gauge vinyl that is durable and easy to maintain. Quality tested 20.8 gauge waterproof flocked top with 15 gauge vinyl beams and bottom. Quick free flow deflation plug. Compact storage. Approximately 7.5" inflation height. Available in Jr. Twin (30x76"), Twin (39x75"), Double(54x75"), Queen size(60x80"), King (72x80") Air Pump not included. 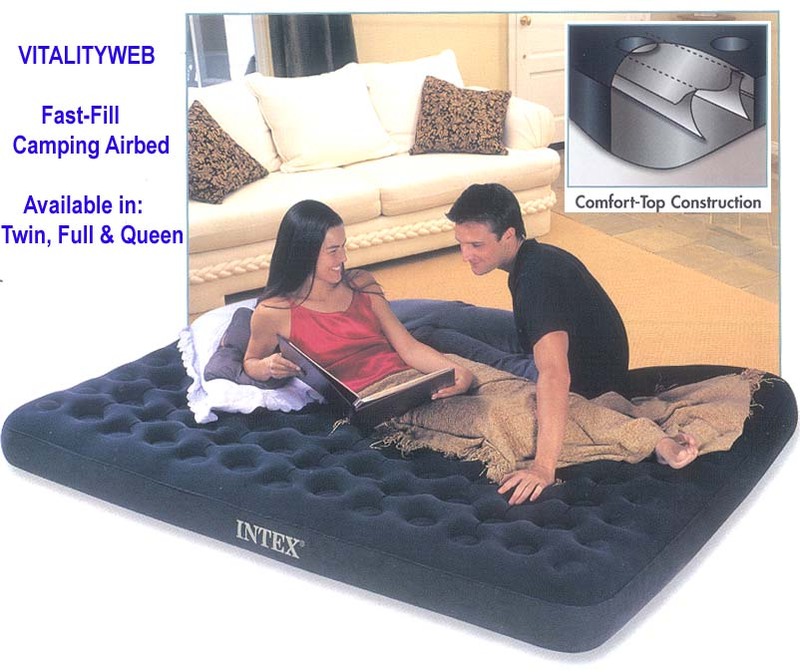 Queen KIT includes - 2 pillows (19x12.5") and Quick Air Pump. Supreme Nylon AirBed Air Mattress - Our top-of-the-line Supreme AirBed Air Mattress is engineered with an innovative inner support that improves sleep performance. The unique inner support system is achieved by a unique electronic welding technique that interconnects welds running both the length and width of the airbed. This uni-body type of construction helps minimize sagging, dipping, lateral sway and the "see-saw" effect common in less expensive mattresses. It also helps maintain a uniform "pull" between the top and bottom surfaces resulting in a flatter sleeping surface for better posture. Plush, waterproof nylon flocking covers the mattress top and sides for a more luxurious look and feel, while a special tufted pillow top sleeping surface further enhances comfort. Quality tested 20.8 gauge waterproof flocked top and sides with 16 gauge vinyl beams and bottom. Air Cushion body support minimizes pressure points. Adjust firmness by adding or releasing air. Quick free flow deflation plug. Compact storage. Nylon Storage Bag. Approximately 8" inflation height. Available in Twin (39x75"), Double(54x75") or Queen size(60x80"). Optional DC (battery) or AC (wall) Pump Kits Available.